Playing golf in Naples is one of our great pastimes. The Rookery in Fiddler’s Creek is one of the highlights of life in the community. Officially named The Rookery at Marco’s, this private members golf course is owned by the Marco Island Marriott Resort & Spa, and is one of the most celebrated courses in the Marco Island and Naples areas. Originally designed by Joe Lee in 1991, and re-designed by Robert Cupp Jr. in 2003, the renowned Naples golf course is nestled in a beautiful wetland preserve which attracts a wide variety of species of birds. A member of the Audubon Cooperative Sanctuary program, the course’s design pays close attention to the needs of the preserve’s birds and wildlife. But there is no doubt that the tranquil lakes and wild marshes around immaculately manicured greens and lush mowed fairways adds a striking beauty to The Rookery at Marco’s. A 18-hole 72-par course, The Rookery in Fiddler’s Creek is considered a unique golfing experience, even for the well-traveled golfer. Stretching for more than 7,100 yards, the beautiful surroundings is certainly something to behold, but the challenges offered by this championship course makes it a favorite. Weaving its way through several Fiddler’s Creek villages, the course fairways are broad with lush Bermuda grass, while the greens boast Tif Eagle blades that encourage a faster roll. Five tee-off locations mean golfers of all levels are catered to, while the renowned Naples golf course boasts a GPS system so players always know the precise distance they are from the hole. 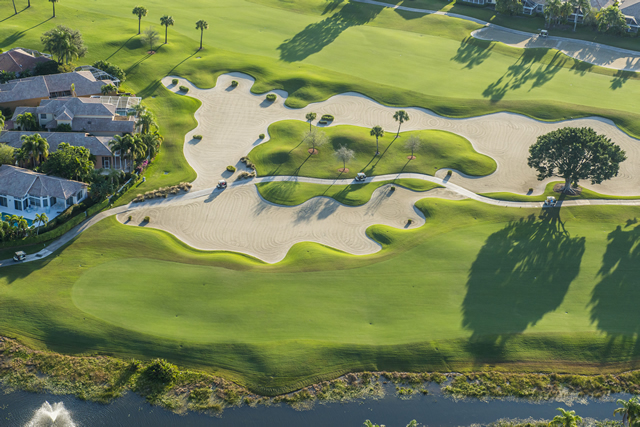 A private golf course, The Rookery in Fiddler’s Creek has a limited membership of just 300, but for anyone who does get a chance to play on the renowned Naples golf course, the facilities are truly world-class. The clubhouse at The Rookery is an excellent place to unwind in the club bar after your round. You can also grab lunch before the taking on the back nine, or even stay for a superb evening dinner, at the famous Rookery Grill.